Great feature set, easy to learn. Well-structured, well-supported, and fully-featured. 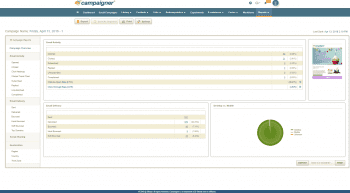 Campaigner has a vast set of tools to allow us to customize our emails with personalized information. The reports and analytics are best-in-class. We use this for internal communications in a large (10,000+ employees) company with offices spread across the U.S. I’d recommend taking with a grain of salt reviews from a person (who clearly posted twice) who is too disorganized/lazy to end their free trial. The fact that Campaigner gives s 30-day free trial is, by itself, a really good feature for those trying it out. Just make sure you’re not too lazy to cancel if you no longer want the service. Great feature set, easy to learn. Well-structured, well-supported, and fully-featured. 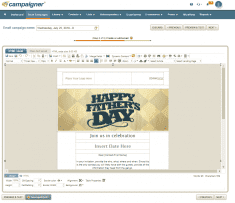 Campaigner has a vast set of tools to allow us to customize our emails with personalized information. The reports and analytics are best-in-class. We use this for internal communications in a large (10,000+ employees) company with offices spread across the U.S.
I’d recommend taking with a grain of salt reviews from a person (who clearly posted twice) who is too disorganized/lazy to end their free trial. The fact that Campaigner gives s 30-day free trial is, by itself, a really good feature for those trying it out. Just make sure you’re not too lazy to cancel if you no longer want the service. 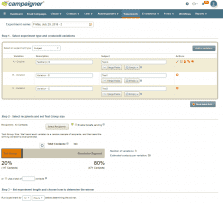 Campaigner is an email marketing provider for businesses of all sizes. They offer customizable pricing plans with many features including CRM integrations and an award-winning customer support team. Beginning, intermediate, and professional email marketers, regardless of industry. Campaigner’s pricing plans are determined by the number of contacts your business has. For more information, check out their pricing page. 2017 People’s Choice for Favorite Customer Service, Stevie Awards. Campaigner’s Associate Director of Revenue Operations, Seamas Egan, was presented with the 2017 Gold Award for Sales Operations Professional of the Year, Stevie Awards. Sheryl Dobson, Director of Campaigner’s Customer Contact Center, earned a prestigious Gold International Business Award as 2017 Customer Service Executive of the Year in the Telecommunications category, Stevie Awards. J2 Global Customer Support scored two Silver awards for best Customer Service Department and Contact Center of the Year, Stevie Awards. The Campaigner Customer Service department garnered two Silver 2017 International Business Awards in the Customer Service Department of the Year and Customer Service Team of the Year categories for Telecommunications, Stevie Awards. If customizable price plans and award-winning customer service are high on your business’ list of priorities, Campaigner is a great option worth considering. They offer a significant number of features for each plan, which is based off of how many email contacts your business has. Their features, though extensive, can be found with other programs; however, what jumps out the most is Campaigner’s ability to work with the largest of companies/enterprises. Campaigner’s ability to reach out to businesses of any size is worth noting. The sizes range from 1,000 contacts to 10-million-plus, with their plans starting at $19.95. Campaigner is making it clear they’re versatile enough to handle the specific needs of any size business. The higher the number of contacts your business has, the more expensive your plan will be, but their plans are affordable, and for the largest of businesses, you can contact Campaigner to speak to someone directly. There is a steady increase in features provided in each pricing plan. These features are broken down into six categories: Standard Features, Delivery, Automation, Targeting, Integration, and Account Access Levels. Each category comes with four or five features. Campaigner clearly breaks down each feature which is helpful for those who may be new to the email marketing world. 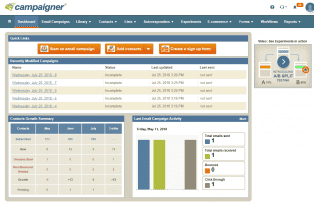 Campaigner also provides users with an award-winning customer support team. They’ve recently won a large handful of Stevie Awards, and they’re all gold and silver. If you’re a new business owner, this is encouraging because someone from Campaigner will always be there to help. If you’re one of those companies with over 10 million contacts, it’s also encouraging to know that Campaigner is capable of not just providing tons of features to large companies, but also fixing any issues that may arise. Overall, Campaigner is a great option for businesses of any size. Their customer support team has won numerous awards, which should give your business confidence that any issues that may arise will be solved quickly and efficiently. Each of their customizable pricing plans offers a ton of great features, including CRM integrations, which will only help your business’ email marketing campaign become significantly more successful. What Do You Think of Campaigner?